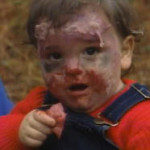 I said yesterday we were hoping to class things up with The Walking Dead, and you know what? We totally did — or rather, Boris Karloff did. The man has gravitas. 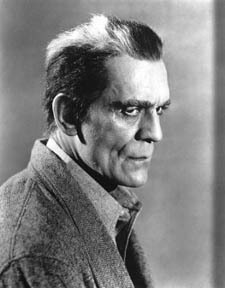 The movie itself, while it didn’t conform to many tenets of what one might expect from a zombie movie, was well made and fairly entertaining for a 1936 movie, but Karloff is why it is special. He has a real presence, and he lends this odd tale of a man returned from the dead to witness supernatural revenge befall his murderers (they frame him for a murder and get him executed). His accusing stare and the way his eyes communicate remorse and sadness as he witnesses each death are brilliant. Note I say witness — this isn’t really a revenge tale, because he has little or nothing to do with any of them dying, and as I said, he looks genuinely sad when they die (although he seems plenty angry beforehand). So far, the pre-’60s selections have been awesome. We’ll see if that trend continues when Plan 9 from Outer Space gets its turn. Tomorrow night we watch Resident Evil and I see if it is as crappy as I remember, or if I overlooked something the first time through.